Kid Rock has been relieved of his grand marshal duties for Nashville's Christmas Parade after calling Joy Behar a 'b***h' during an interview on Fox and Friends. The decision to drop the rock star comes after Nashville Mayor David Briley sent out a statement saying that he would be less 'inclined not to participate' if Rock was kept as the grand marshal. The staunch Republican musician was being interviewed at his Nashville bar on Friday morning when he said: 'People need to calm down, get a little less politically correct and love everybody. Except, I would say, screw that Joy Behar b****'. Fox and Friends host Steve Doocy immediately apologized on air for the remark. Later, Behar addressed it on her own show where her co-stars lampooned the singer. 'This b**** and these b******s will be happy to have you on the show and have a beer,' Behar, a proud Democrat, said. She went on: 'What is it about me that he feels the need to say that though? Who am I? She won the support of Meghan McCain who said: 'I don't agree with calling any woman a b**** for having a political opinion, people do it to me all the time. 'I don't agree with that. What surprises me about Bob, doing this, I have had many interactions with him...he is a big Republican. 'This is very off tone for where he's been. I don't think it's appropriate what he said. 'I wish that that he would practice what he preaches as we all should practice what we preach coming together because we are all ultimately Americans,' she said. The other women agreed with Sunny Hostin's remark at the start of the segment that if 'you come for one of us, you come for all of us'. Abby Huntsman, who used to anchor Fox and Friends, praised Doocy for his quick apology on the air. 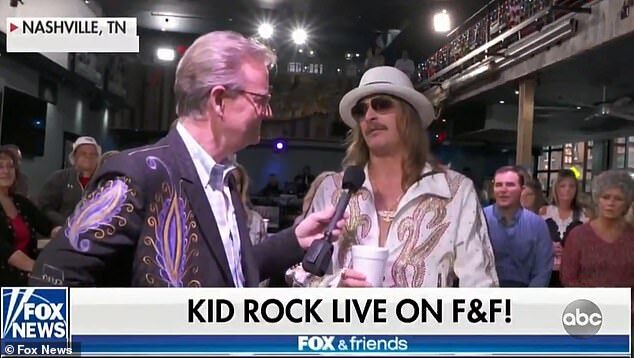 The mayor of Nashville also criticized Kid Rock for the remark and said he would not attend the city's Christmas Parade, where he will serve as grand marshal, because of it. Nashville Mayor David Briley's office says he's 'inclined not to participate' in a Christmas parade if Kid Rock remains grand marshal.